In the Post-Apocalypse world, the Collectors confront Winston and Leo, who can't put a dent in them with the proton streams. Before the Collectors can nab them, they're suddenly called back against their will. Not looking a gift horse in the mouth, Winston and Leo open a new dimensional portal and bail. In Purgatory, the mad Darius Dun is so angry that the Collectors let the Turtles escape that he performed the summoning ritual a second time just so he could berate them for their failure. Furious, the Collectors decide that since the price for the first summoning was a portion of his soul (which drove Darius mad), the price for a second summoning would be the rest of his essence. The Collectors consume Darius, but his will overpowers their own and he takes over their hive mind. Darius tells Bronson that with this new power, he will get his revenge on Splinter and the Foot Clan, but first he's going to decapitate the Turtles. In the animal world (the city of Zoo Amsterdam), Michelangelo reasons with that universe's Ghostbusters, insisting that Peter is not an entity that needs to go in the Containment Unit. 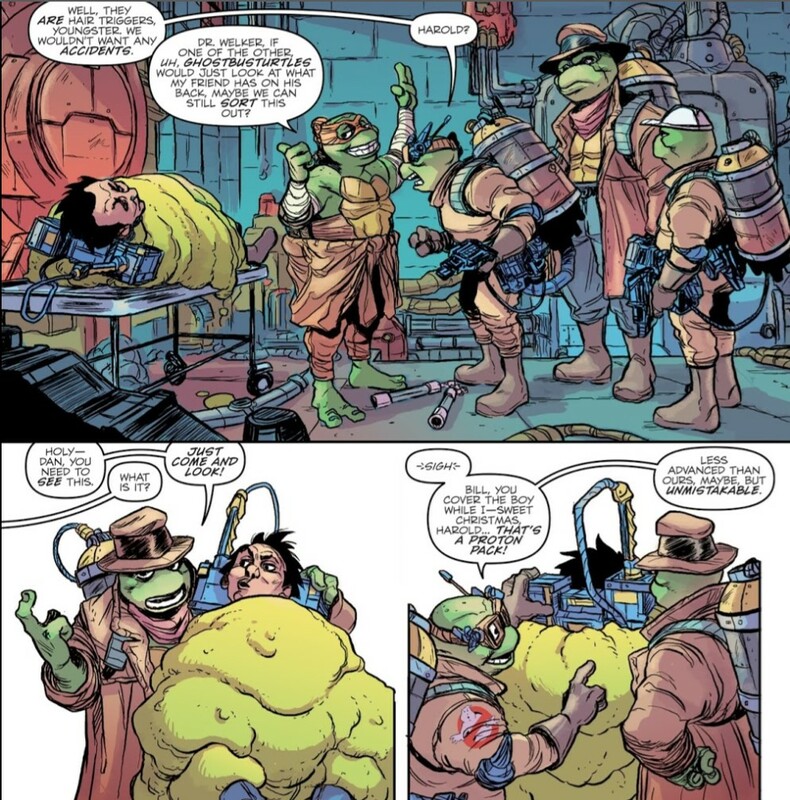 He proves that Peter is an alternate universe counterpart to the "Ghostbusturtles" by showing them his proton pack. 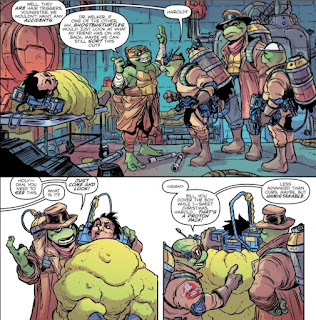 The Ghostbusturtles run some tests to confirm Mikey's story and then free Peter. Peter compliments Mikey on talking his way out of a bad situation and, after suggesting a psychology degree, the two open a new portal and leave. In the Scandinavian afterlife, Raph has no luck piloting Ray's body against his own possessed form, as Ray is too out of shape to fight. Coming up with a plan, Ray tells Raph to use the spritzer of positively charged mood slime on his possessed body, but he'll have to spray his body and Ray's body simultaneously. 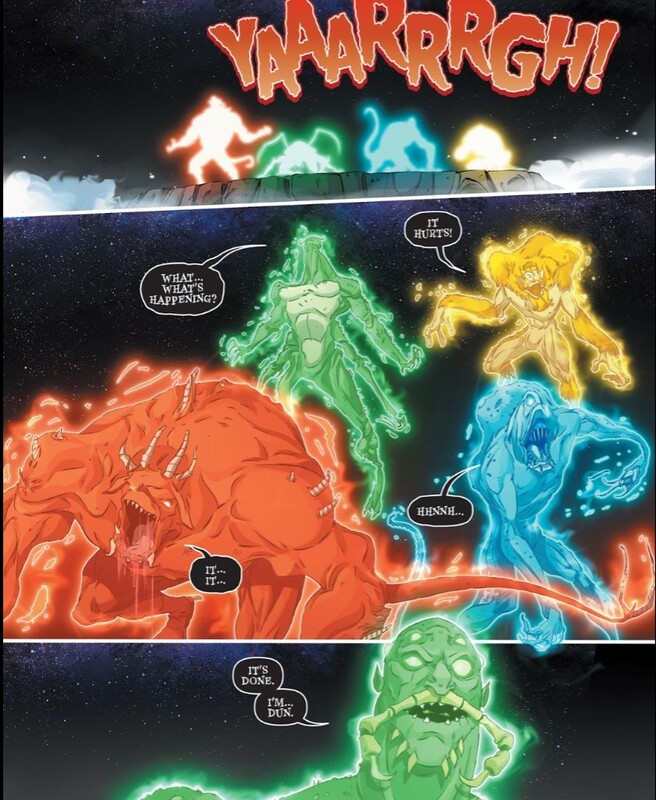 The mood slime, which reacts to anger, drives Raph's spirit out of Ray's body and the Viking spirit out of Raph's body, allowing Raph to retake his own body. Ray then opens a portal and the two escape before the rest of the Viking ghosts can attack them. At the warehouse in Red Hook, in the Ghostbusters' dimension, Donatello and Egon put the finishing touches on the Portal Trap and the proton weaponry. 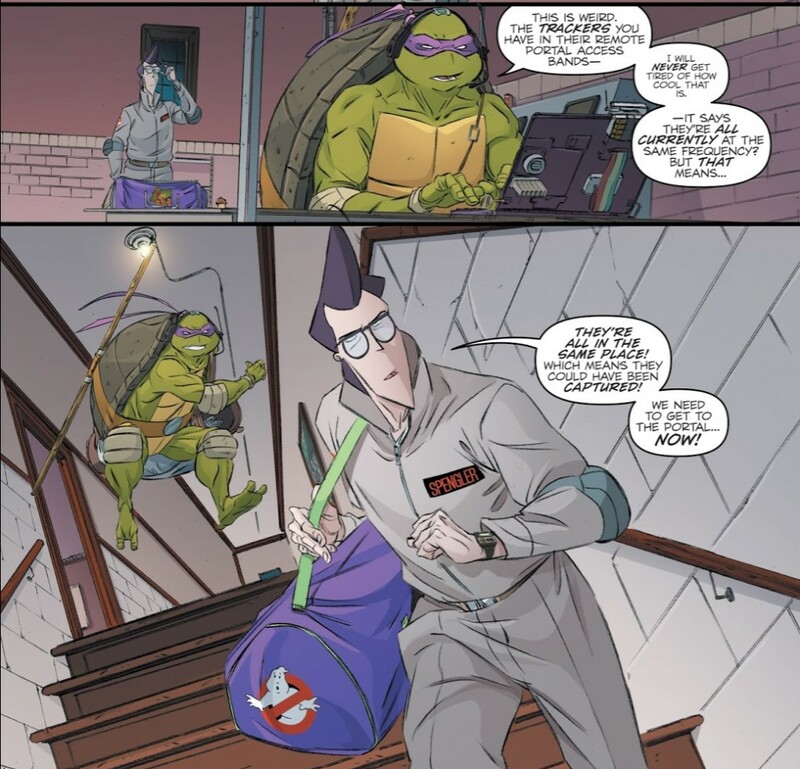 Donnie asks Egon what it was like being truly dead and brought back to life. Egon admits that his only real regret is that he was revived by supernatural means and not scientific ones and envies that Donnie was able to cheat death using technology. Before they can discuss it further, Donnie gets a notice on the portal tracker that the other Turtles and Ghostbusters have convened in the same dimension. Suspecting trouble, Donnie and Egon grab the gear and open up a portal to join them. They find the others all together in another dimension that looks like a garden. But another figure has joined them and claims to be the one who summoned all of them to her garden. The Turtles recognize the spirit as Tang Shen, their mother. 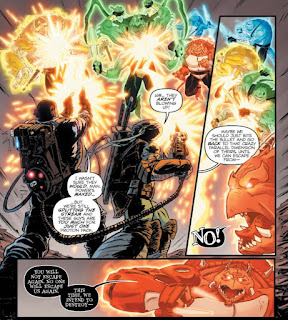 *This story is continued from TMNT/Ghostbusters 2 #3. The story concludes in TMNT/Ghostbusters 2 #5. *Dr. Danny Welker is named after Dan Aykroyd and Frank Welker, two actors to have portrayed Ray in the Ghostbusters franchise. From that, we can presume that the remaining "Ghostbusturtles" are Dr. Harold Lamarche, Dr. Bill Music (or Coulier) and Ernie Hall (or Jones). 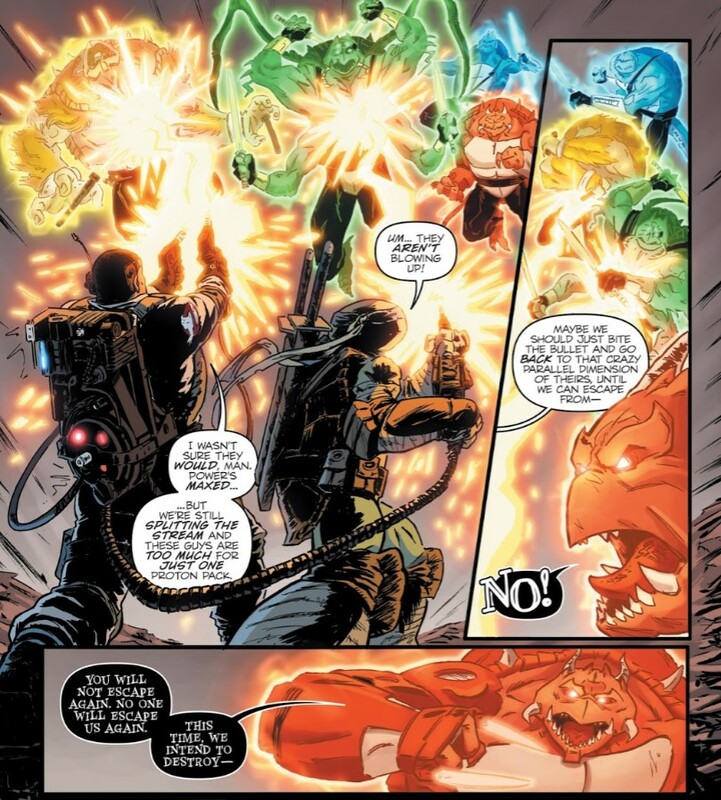 *Ray mentions the time that Winston was possessed by Chi-You in TMNT/Ghostbusters #4. *This issue was originally published with 3 variant covers: Cover A by Dan Schoening and Luis Antonio Delgado, Cover B by Mark Torres, and Cover RI by Ben Bishop. The dueling narratives wrap up in this issue, in time for the conclusion next chapter. What's refreshing is that each conflict is resolved differently and some in ways that might be seen as unsatisfactory had this been an episodic anthology. But by divvying up the arcs a little each issue, I think it gave Burnham and Waltz freedom to resolve some of those arcs without any action; because if one ends with a peaceful exchange of words, that's okay, because another ended with blasting and punching. Winston and Leo escape the Collectors through what at first seems like Darius' stupidity, but turns out to be part of a master plan he'd concocted either before or after he went insane. That a rather D-list Turtle villain could overpower the will of four godlike trans-dimensional entities is maybe a little iffy, it at least took him off the sidelines and into the battlefield. Mikey talking his way out of the standoff with the Ghostbusturtles was what I was getting at in the opening paragraph of this review. Sandwiched between two action-heavy tangents, it worked great and resolved the conflict in a manner that complemented Mikey's earlier therapy session with Peter. It was also a good showcase of Mikey's personality as a people person. He's very outgoing and extroverted (a "party dude", if you will) because he likes people and he GETS people. And of all his brothers, he'd be the first one to try a non-violent approach to solving a problem. I'm glad we were able to get this ending thanks to the mini's format. The Ray and Raph storyline, as I said last review, was falling flat for me and it didn't pull any fourth quarter miracles, here. 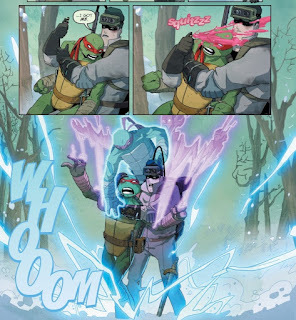 Ray using the positively charged mood slime to drive Raph's angry spirit from his own body as well as the spirit of the Viking ghost from Raph's body was actually pretty clever, but it was accompanied by a rather eyerolling sequence where Raph tries to stammer out why he's so grouchy all the time. What was more fun about their team-up was that they were the odd couple pairing in this mini and so it was fun to see a badass brawler try and work together with a doughy optimist. Egon and Donnie end their conversation comparing their flirtations with death and the revelation from Egon was a bit surprising. The idea that, as a scientist, he had to rely on what was essentially "magic" to bring him back from the dead when technology, his life's passion, should have been sufficient... it bruises his ego and leaves him feeling inadequate. That was a dimension to the character I'd never considered before, especially since Ghostbusters 101 had mostly overlooked any emotional aftermath on his end from his death and resurrection, so I'd just figured he was over it. One of the reasons why Burnham is so good at writing these characters; he can tell you something new about them without having to fundamentally change them. As for the cliffhanger, I feel foolish for letting it take me by surprise. By that, I mean, I should have expected Tang Shen to pop up the second Charles Paul Wilson took over the pencils. One of IDW's traditions since nearly the start of their TMNT series has been to utilize him on any issues or segments of issues that take place in Feudal Japan or feature an appearance from Tang Shen. Kind of a big hint. But I guess I had my blinders on, because I didn't see that one coming. But hey, it is Saturday night, after all. I've got other things on my mind. I couldn't identify all of the cover A art cameos. Also, I've encountered some disagreement over whether the crocodile on the cover is Jack Marlin or Leatherhead. I thought Jack Marlin because of the distinctive hat. I can also identify versions of Ace Duck, Dirtbag, Doctor El, Panda Khan ("Panda Cop" pun), Man Ray, Mondo Gecko, April O'Neil and Wingnut. I initially thought Doctor El was IDW Manmoth (though not a mammoth) because of the broken tusk, until someone pointed out Doctor El to me who also has the same kind of broken tusk. I can't uniquely identify the rabbit or the fish. My best feeble guesses is that the fish is Other (from Archie TMNT issue "1492") and the rabbit is Karl (from TMNT & Other Strangeness), but neither look conclusively more like those characters than they do to other fish or rabbit characters. 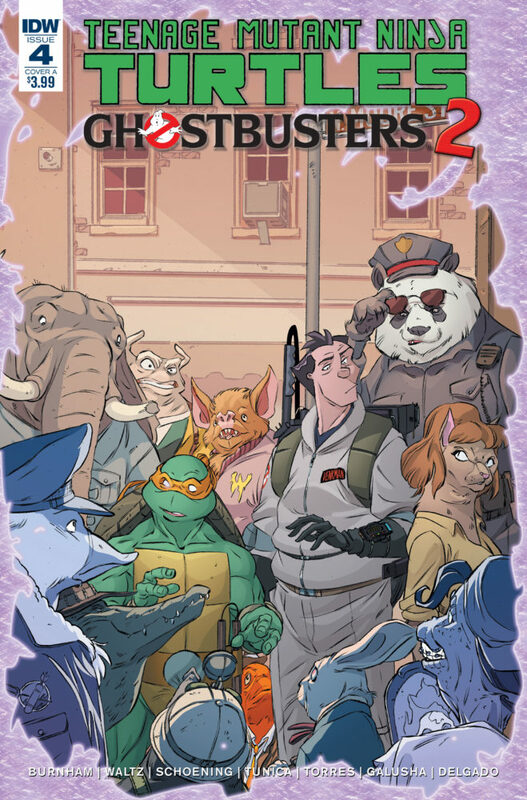 Also, considering Venkman had Mikey put on his uniform to avoid looking naked, but he's naked on cover A, it kind of looks like some of the characters are rubbernecking at the naked turtle at least as much as they are at the human.